Finally -- an emo-punk album that realizes choruses and hooks are important, too! You know those times when you wake up one day to find that the entire pop-music axis has rotated while you weren't looking and suddenly you feel very old? This humble reviewer hit that point while listening to Hawthorne Heights' second album, a collection of tight, metal-riff-charged emo tunes, only to realize that just about every other American pop-rock CD coming out now sounds just like it. What happened to the three-chord punk fury of old? Now every American teenager seems to be a guitar virtuoso who can support a song with complex arpeggios. Blink-182 fart / copulating-with-canine jokes? Gone, replaced by sincere heart-wailing. Instantly catchy choruses? Nope -- these days you can't even tell where a verse ends and a chorus begins. Hawthorne Heights must have noticed this change somewhere within the pockets of their creative minds as well, because while much of If Only You Were Lonely exemplifies the current emo-punk movement, a wave of Green Day-Blink nostalgia underpins the CD in the way only a pop-culture-saturated generation could cannibalize such recent history. Translation from critic-ese: these songs have an Enema of the State-resembling catchy, melodic poppiness the likes of which has been sorely lacking from the recent emo-core scene. 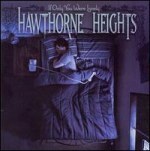 Hawthorne Heights first broke it big with the single "Ohio Is For Lovers", and their basic sound hasn't changed too much since then. Among their most distinctive strengths remain their ability to spin off immediately catchy guitar hooks and write soaring choruses, as well as frontman J.T. Woodruff's tender, boyish voice. In other words, take emo-punk and co-opt the best parts of 90's pop-punk. By and large, If Only You Were Lonely doesn't stray much from the formula, though it does show significant songwriting growth from their debut. The tracks this time are much more consistent. With each song clocking in at around a solid three minutes, the album shows a confident band belting off catchy tune after tune. This "if it ain't broke, don't fix it" attitude produces its share of good songs: "Dead In The Water" is classic emo-punk, "Breathing in Sequence" sounds like a Blink hit turned into minor (with its share of blood-curdling screaming, of course), and "Where I Can Stab Myself In The Ears" injects a bit of dark atmosphere to an active, upbeat tune. But it also produces some mediocre filler. No song on the album is downright bad, and most are fairly pleasant to listen to, but songs like "Cross Me Off Your List" reek too much of emo cliché and stale melody to really be memorable. Perhaps the disc's greatest limit is the band's unwillingness to experiment more. The midtempo closer, "Decembers", represents the greatest leap from their basic sound, incorporating keyboards and capitalizing on Woodruff's voice to create a tender ballad that resembles Brit-rockers Snow Patrol more than any American punk band... and it's absolutely fantastic. Hawthorne Heights don't quite have the nervy energy or wit of a My Chemical Romance or Fall Out Boy yet, but their second album is a solid pop effort that reveals space for more growth.